1) Multiple attacks rocked Kashmir Valley: Ahead of Prime Minister Narendra Modi’s election rally in Srinagar and Anantnag on Monday, four separate militant attacks rocked the Kashmir Valley on 5 December 2014. In the most serious attack of the day, six militants stormed an Army camp at Uri, 20 km from the Line of Control, around 3 a.m. In the ensuing gun battle, eight Army soldiers, including a Lieutenant- Colonel, three Jammu and Kashmir policemen and all the six militants were killed. 2) Cabinet secretary Ajit Seth gets six-month extension: Cabinet secretary Ajit Seth was on Friday given a six-month extension in service, third time after he was appointed to the top bureaucratic post. The extension of Seth was approved by Appointments Committee of the Cabinet (ACC) headed by Prime Minister Narendra Modi. The ACC has approved extension of Seth as Cabinet secretary for a further period of six months beyond December 13, an order issued by the department of personnel and training (DoPT) said. 3) ICICI Bank sells Russian subsidiary to Sovcombank: The board of country’s largest private sector lender ICICI Bank on 5 December 2014 approved sale of the bank’s shareholding in its Russian subsidiary ICICI Bank Eurasia, to a third party Sovcombank. “ICICI Bank Ltd has informed BSE that the Board of Directors of the Bank at its meeting held on December 05, 2014, approved a proposal for the sale of ICICI Bank’s shareholding in ICICI Bank Eurasia Limited Liability Company (IBEL), a non-material wholly-owned banking subsidiary in Russia, to Sovcombank, an unrelated third party Russian bank,” ICICI Bank said in a release to the Bombay Stock Exchange. 4) SBICap Trustee launched online Will creation service: To help individuals create their own Wills seamlessly, SBICap Trustee Company -- a subsidiary of the investment banking arm of the country's largest lender SBI -- on 5 December 2014 launched an online Will creation service. The service, christened "MyWill Services Online", allows users to create their Will in a six step process involving registration, verification, payment, data entry, review and generation, SBICap Trustee Company said. It said the service is the only online Will creation portal in the country and assured that data shared will be kept confidential. Users will be charged Rs 2,500, excluding payment gateway charges and taxes, for creation of the Wills, which can also be edited within a stipulated time, it said. 5) RBI eases rules for white label ATMs: The Reserve Bank of India has allowed operators of white label Automated Teller Machines (ATMs) to accept international credit, debit and prepaid cards. It also also eased rules for cash supply tie-ups at these. A while label ATM (WLA) is operated by a non-bank entity; customers from any bank may withdraw money from these, for a fee. 6) Maldives hit by water crisis, India sends help: With the Maldivian capital facing an acute water crisis after a fire in the city's water treatment plant, India on 5 December 2014 sent an IAF transport aircraft and naval vessels carrying a large consignment of water to meet the immediate requirement of over 100,000 people. A major fire broke out at the Male Water and Sewerage Company (MWSC) generator control panel on December 4, causing extensive damage to the cabling of the generator to the Distillation plants and disconnection of water supply. The only water available at Male is stored in tanks and sumps and is being supplied for one hour every twelve hours. The city, located on a low-lying island in the Indian Ocean, has no natural water source and entirely depends on treated sea water. 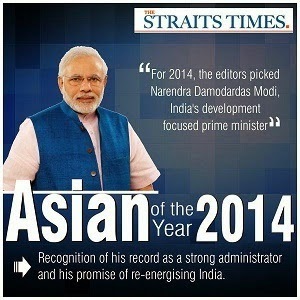 7) PM Narendra Modi named 'Asian of the Year' by Singapore daily: Prime Minister Narendra Modi was on 5 December 2014 named 'Asian of the Year' for being development-focused leader of India by editors of Singapore's leading daily, The Straits Times. "Despite being relatively new to the job, he has already made a mark on Asia, reaching out to neighbours and receiving national leaders including Xi Jinping of China and Tony Abbott of Australia," said the Singapore Press Holdings Limited, publisher of the daily. 8) International Volunteer Day observed: The International Volunteer Day for Economic and Social Development was observed across the world on 5 December 2014. The day, which is also known as International Volunteer Day (IVD), gives volunteers a chance to work together on projects and campaigns promoting their contributions to economic and social development at local, national and international levels. 9) Don't replace Mahatma Gandhi with other leaders on banknotes: RBI panel : A Reserve Bank panel has decided against the inclusion of any other national leader's image on banknotes saying that no other personality could better represent the ethos of India than Mahatma Gandhi. On the advice of government, RBI had constituted a committee for designing future currency note in October 2010, finance minister Arun Jaitley said in a written reply to the Lok Sabha. He said the Committee, inter alia, deliberated on the issue of changing the existing image of Mahatma Gandhi and inclusion of certain other personalities in the new design of banknotes. "After due consideration, the committee decided that no other personality could better represent the ethos of India than Mahatma Gandhi," Jaitley said. 10) Nasa launches new Orion spacecraft and new era: Nasa's new Orion spacecraft streaked into orbit 5 Dec 2014 on a high-stakes test flight meant to usher in a new era of human exploration leading ultimately to Mars. The unmanned orbital journey began with a sunrise liftoff witnessed by thousands of Nasa guests. Parts of the spacecraft peeled away exactly as planned, falling back toward Earth as onboard cameras provided stunning views of our blue, cloud-covered planet.